I am very thankful, Coach Seaman helped me with an early podcast to launch laxcoachmike.com back in 2009. 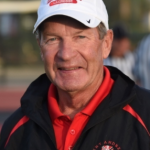 During a coaching career that spanned 30 years Tony Seaman became one of college lacrosse’s most successful, decorated and recognizable coaches of his era. He amassed a 263-166 record, which currently ranks him 22nd among college lacrosse coaches all-time. His record included 19 trips to the NCAA Tournament and nine conference titles. Coach Seaman began his career at C.W. Post (13-3) in 1982, the Pioneers’ first season of Division I competition. He was then hired as the University of Pennsylvania’s 19th head coach, enjoying success almost immediately while compiling a 74-37 record. In 1991 he began an eight-year stint at Johns Hopkins where he accumulated a 77-33 record including eight straight NCAA berths advancing to the semifinals four times. His 1995 team was a perfect 12-0 in the regular season. Towson was his final stop where he led the Tigers from 1999-2011 with a 99-93 record. He steered the Tigers into the NCAA post-season five times, winning four conference titles and as many league coach of the year awards along the way. Now he is the Head Lacrosse Coach at St. Andrews in Boca Raton Florida. In his three years as the team’s general manager, the Outlaws have amassed a league-best 34-8 (.810 pct.) record that represents a league mark for most wins in a three-year span and delivered Denver its first MLL Championship. This full podcast will really make you think!